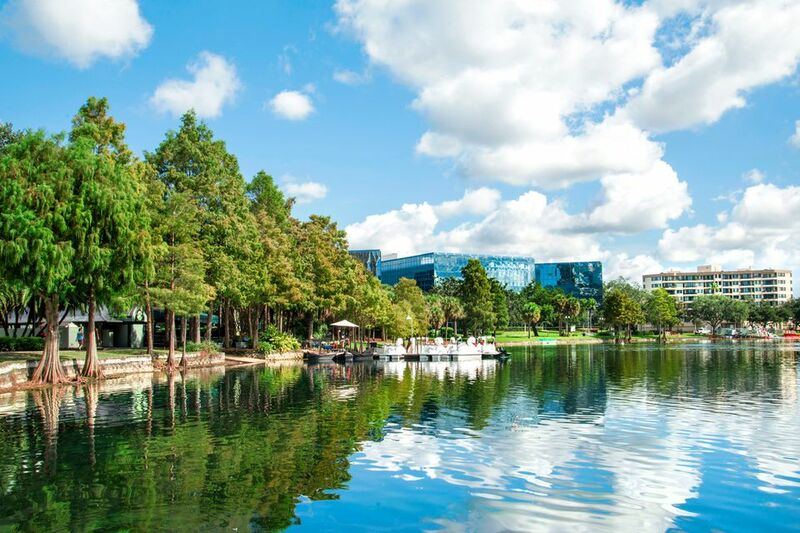 Central Florida, which includes the Orlando area, has a humid subtropical climate. The area gets an average of 51 inches of rain every year, while the average in the U.S. is 37 inches per year. Its rainy season is from May through October, so you'll need an umbrella for sure at that time of year. The other months of the year are essentially the area's dry season, a time of year when you will likely see an abundance of sunshine. Temperatures are moderate all year, with the summer the least comfortable because of high heat and humidity. Although a major hurricane hasn't hit the city of Orlando directly in several decades, tropical storms caused by the Atlantic Hurricane Season often bring a deluge of wet and windy weather to the region. Hurricane season runs from June through November for much of Florida, which can put an unexpected damper on travel plans during the busy summer and fall tourist seasons. However, if you adhere to severe thunderstorm safety guidelines and stay tuned for the latest hurricane information for Orlando during your trip, you should be able to avoid a major disaster on your vacation. The winter months of December, January, and February generally provide the most pleasant temperatures in the Orlando area; humidity can still be on the higher side but rainfall is at a minimum. This is the time of the year when the snowbirds of the north, ready for a break from cold dreary days, visit Florida. Average high temperatures hover near 70 degrees Fahrenheit (21 degrees Celsius), with average lows around 50 F (10 C). Average precipitation ranges from about 2 to 3 inches each month. What to pack: Since high and low temperatures can vary a good bit in either direction, you should check the forecast before you leave for your trip to better plan your luggage. If you are traveling to the Orlando area in the winter, it's always a good idea to pack a light jacket, but you should also be fine in pants and a long-sleeved shirt or sweater. As spring approaches, Orlando temperatures start to warm up. Though still on the pleasant side, rainfall starts to increase and humidity falls slightly. Additionally, the seasonal "snowbirds" begin their flight north and spring break season begins, which brings an influx of tourists to the region. Springtime average temperatures tend to stay pretty warm—both highs and lows. Average highs range from 77 degrees Fahrenheit (26 degrees Celsius) in March to around 88 F (31 C) in May, with average lows running from 54 F (12 C) in March to 64 F (18 C) in May. Precipitation in March and May runs over 3 inches; in April, the rain lets up a bit, with the average 1.8 inches. What to pack: When traveling to the Orlando area, it's a good idea to pack for extremely high temperatures in any season but winter, but rain jackets, ponchos, and umbrellas are also a must for your suitcase in the spring. Summer comes in with a bang to the Orlando area. Once June hits, you can expect temperatures will climb into above 90 degrees Fahrenheit (32 degrees Celsius) in the afternoon, and record highs oftentimes touch 100 F (38 C). However, evenings can be on the pleasant side, with nighttime lows nearing 70 degrees Fahrenheit (21 degrees Celsius), and if it's a cool period, temperatures can get as cool as 50 F (10 C) in June and mid-60s F (18 C) in the other two summer months. Humidity runs around 60 percent during this season, which increases the steamy effect. June is the start of hurricane season, so you should be aware of the possibility of a sudden tropical storm during your trip. As a result, summer weather can be unpredictable—from weeks without a drop of rain to an ongoing deluge that seems to have no end in sight. Overall, though, rainfall averages around 7 inches in all three summer months, with each month receiving upward of 15 days of wet weather. What to pack: If you are traveling to Orlando in the summer, pack lightweight clothing and items to protect you from the sun and rain; however, a raincoat is a better idea than an umbrella since tropical storms are often accompanied by high winds. Additionally, if you spend any amount of time outdoors, be sure to put on sunscreen. During September, October, and November, the rest of the country is experiencing the cool, crisp days of autumn, but in the Orlando area, summer continues on with high temperatures and the highest humidity of the year. Throughout the fall season, the highs begin to plummet, from an average close to 90 degrees Fahrenheit (32 degrees Celsius) in September to 78 F (26 C) in November. Lows drop similarly, from an average of 72 degrees Fahrenheit (22 degrees Celsius) in September to 57 F (14 C) by November. However, it can still get really hot this time of year. In fact, September saw a record high of 98 degrees Fahrenheit (37 degrees Celsius) in 1988, and the area hit 35 F (2 C) in November 1981. September is generally Florida's peak time for hurricane season, and average precipitation that month is similar to the summer months at about 6 inches. Precipitation levels fall dramatically in October, to an average of a little over 3 inches and continue in that direction in November, when the average rainfall is about 2.4 inches. What to pack: On any given day it can be hot enough for a day at the beach or cool enough for a lightweight jacket, but it is still recommended that you use sunscreen when outdoors. You should fine on your trip if you bring a variety of shorts, pants, short and long-sleeved shirts, and a few sweaters that you can layer depending on the temperature. Although the weather is generally pleasant year-round in Orlando, increased rainfall, hotter weather, and fewer daylight hours can affect how you plan your trip.